There is the water that runs down as melting snow from the high mountains. Water that carries the flour of rocks ground by the glaciers that lie between mountain peaks that loom even higher–mineral flour ground by the weight of the glacier’s captured snow, then suspended in the trickling streams that tickle the glacial underbelly as the cold, cold water seeps through the layers of ancient ice. Flowing from everywhere in the ice, pulled by the forces of earth, trickling down across the grey and brown surfaces of granite, dolomite, and gneiss, they feed into one flow. This growing river’s water is sometimes white with the glacial milk, sometimes green as it dances in the light and begins to roar with the power of all this water, traveling down. 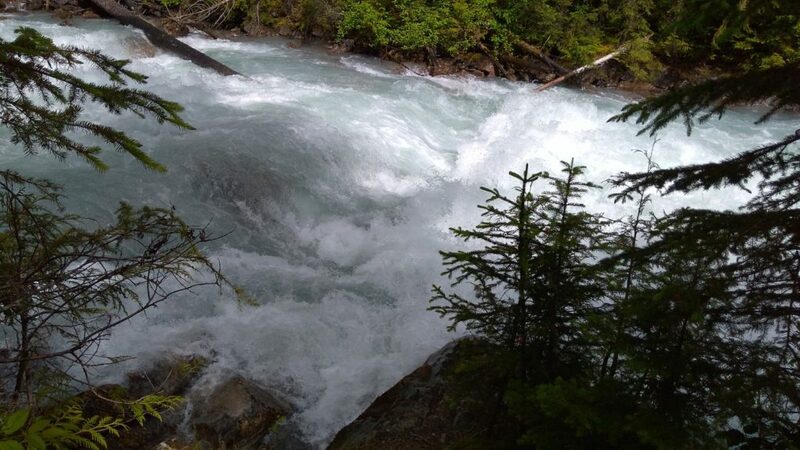 We climb up the trail along such a river which is rushing down the mountain all at one enormous speed, with all energy reaching upward and plunging downward in a tumultuous dance. The sheer force of it runs through me, obliterating all else with its roaring, soaring endless song. Then, there on the other side of the plunging, churning water, a slim tree had fallen and was caught between rocks in the river’s bed, stretching out what was once its sun-reaching height to point upriver. As the water churns past the rocks that grasp it, its tip bobs up and down, its rhythm a complex counterpoint in the music of the water, part of the symphony that all human symphonies yearn for. In these waters that are as much air as water, as much fire as air, there are birds called Dippers that fly through the river itself. Although I watch carefully as I walk along the banks, It is only later in my dreams I see it, a small brown and tan bird, plunging into the frothy white and green waves, going upstream, flying with strokes of its wings in the clear depths, catching bugs and popping out again to bob along downstream for a moment. As we travel higher there is a place where all this tremendous force, this deafening flow, is slowed by a gathering of the debris it has itself carried down the slopes. Behind the debris it pools, resting quietly before it gradually penetrates the barrier and resumes its fall. 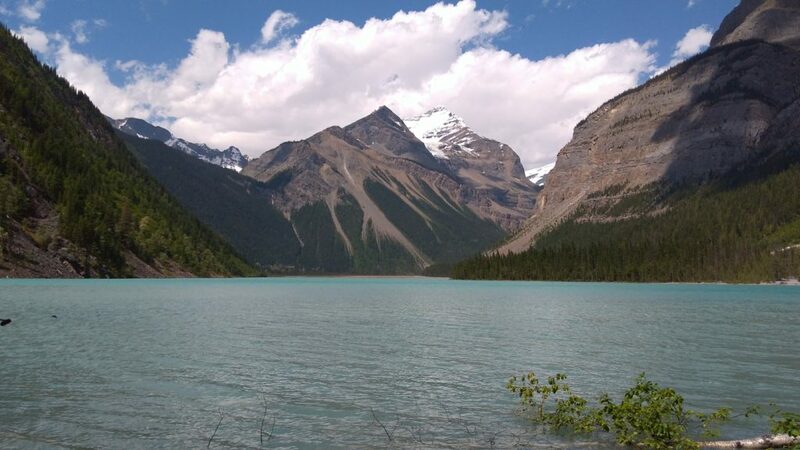 The flow has become a lake above this dam, shining an ethereal turquoise as the sunlight strikes the particles of mineral milk, an apparition neither of earth nor sky but of some otherworldly realm. Watching from the shore the lake spreads inside you, reflecting all quietly, expanding to the outer edges of the soul. A bird may fly through this space, calling. If it does, by its nature, it will pierce into the heart of things. Looking around, the mountains rise into the ether, snow still clinging precariously to their upper reaches. We walk further along the trail, through the forest of cedars and hemlock, now beginning to turn to pines, birch, and ash along the rock slides in the flats around the lake. Here water trickles down everywhere, flowing from the melting snow above down to the lake. We jump over some streams, splash through others. The sound of the water here is as gentle as the music of a softly blown flute, flowing everywhere around us. On the way back along the lake and down along the trail, the tremendous flow of the river carries me with it, dizzying in its dance, its love of gravity. Certainly, there is somehow fire mixed in the cascading water–fire and air. This is why a bird can fly through it. As we walk, we hear a boom followed a moment later by a flash of light searing a white line through the openings in the dark trees. More of the elemental fire. The predicted storm. The rain begins to fall sparsely in large drops, some dripping slowly off the leaves of overhanging shrubs. The smell of ozone wafts through the pervasive fragrance of the cedar. The rain begins in earnest as we stand in a dry spot under a tree and pull our rain jackets out of our packs. There’s a satisfaction in the cool, dry smoothness of them against our still-warm skin as we continue our downhill walk in the rain. The heat of the day remains as an undertone to all this chilling water, leaving pockets of warmth in the cooling air. As we walk into the quiet of the lower forest the rain has stopped. I am empty. There is nothing left but soaring space containing only pervasive and quiet joy. If it were not so late in the day, I would turn around and climb back again, climb further above the lake. I would stay in the presence of all this water, all this elevation. It contains its own yearning.